I take vitamin C as a supplement and I try hard to include it in my diet every day, but I never knew it could be so good for my skin! 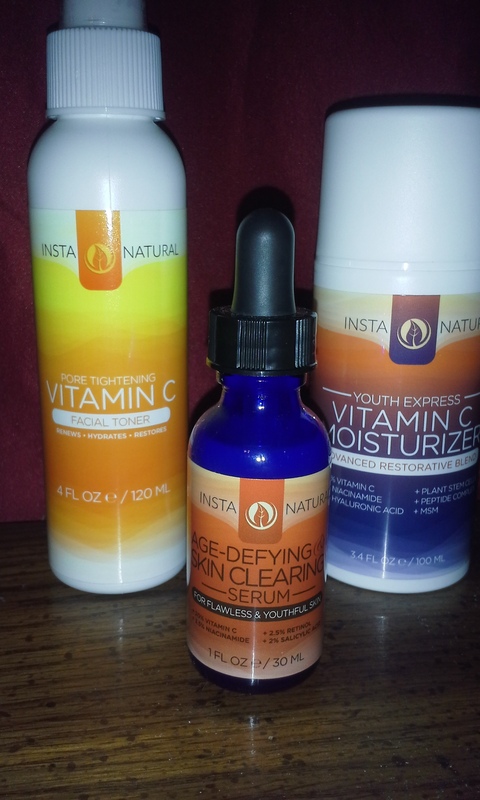 InstaNatural has harnessed the power of vitamin C in their Pore Tightening Facial Toner, Restorative Moisturizer, and Age Defying Skin Clearing Serum. I had never used a serum prior to trying this one out. I have oily skin and for some reason I thought of a serum as being oily. That is definitely not the case with this Skin Clearing formula! 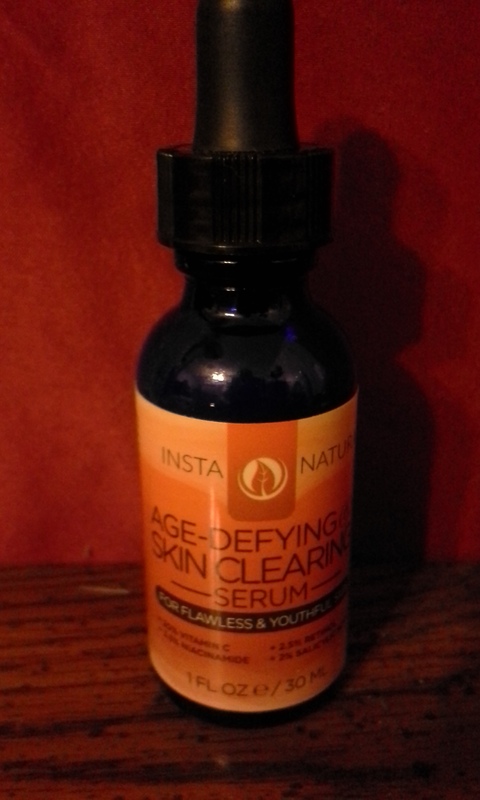 InstaNatural’s Anti-Aging Skin Clearing Serum is a comprehensive solution for those who want to reverse the signs of aging while treating acne and hyperpigmentation. This potent formula includes many key active ingredients to treat and soothe blemished and irritated skin. Sulfur penetrates the skin deeply for maximum results, allowing retinol and salicylic acid to unclog pores while niacinamide removes redness and inflammation. Simultaneously, Vitamin C and Hyaluronic Acid restore health to damaged skin by repairing sun damage and micro scarring, all while delivering a youthful, radiant glow. Here is a close up of about 3 drops of the serum on my hand. You only need about 6 for whole face coverage! I apply this when I get hormonal breakouts, and they usually shrink by the morning. I will for sure be adding serum to my permanent beauty routine. After washing your face, there’s nothing like a good toner to tighten pores and make your skin feel refreshed. I loved the fact that this toner comes in a spray bottle…I don’t have to mess with getting out a cotton ball and pouring some out of a bottle and probably spilling. A couple of sprays gives your face an instant cooling effect, and you can notice a slight orange scent. I bet this will be amazing in summer after workouts! 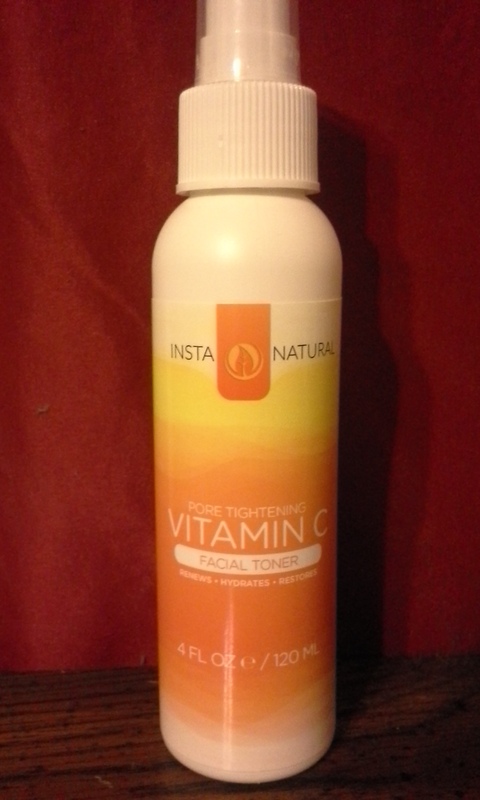 Vitamin C in a moisturizer form is the final touch you need to keep your face soft and supple. 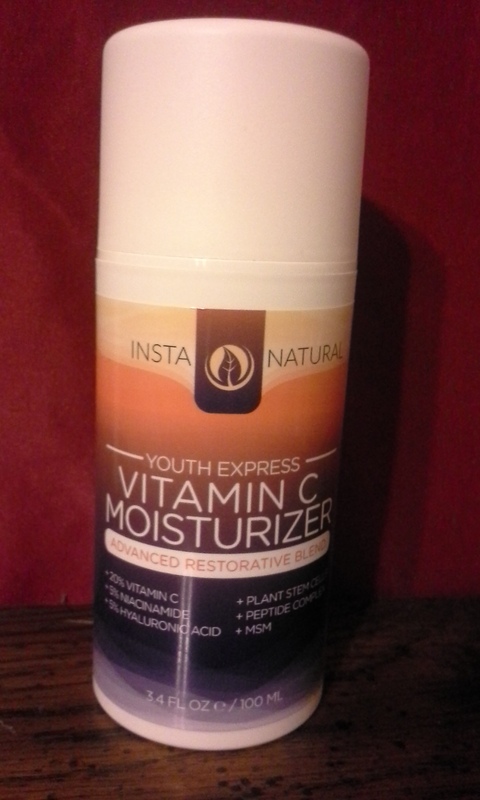 InstaNatural’s Vitamin C Moisturizer contains a proprietary blend of supercharged antioxidants and other powerful ingredients that can help you achieve a healthy and glowing complexion. Vitamin C is a well-known antioxidant agent, which can help protect your skin from the damaging effects of sun exposure and UV rays. Our moisturizer will deliver a potent 20% dose of Vitamin C to your skin, along with other nourishing ingredients – such as Niacinamide, Hyaluronic Acid, and Plant Stem Cells – that work together to reduce the appearance of signs of aging, such as wrinkles, age spots, discoloration and dryness. This moisturizer is amazing to me simply because it helps protect from the sun! I have had a hard time finding a daytime moisturizer that offers sun protection as well as a non greasy feel. I am happy to say that this one does the job! I can put it on first thing in the morning and not have to worry about the sun’s harmful rays. Any dry patches are gone overnight after using this lotion as well, and that is superb. As always, InstaNatural offers a 100% money back guarantee for all its’ products. All items are also made in the USA and animal cruelty free! Posted on March 9, 2015, in product review. Bookmark the permalink. Leave a comment.